Shooting in Canada in the Spring enabled us to absolutely capture the atmospherics of France in 1918. 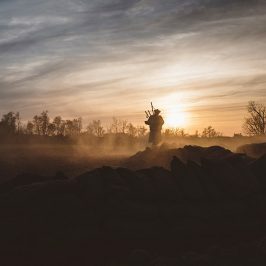 The landscape provided the authentic backdrop for the soldiers’ visceral experience in the battlefield and the nurses who patched up the wounded in the casualty clearing stations. Our battle drama is dynamic, intense – full of the desperate energy of youth. We wanted to resurrect a sense of shock missing from familiar forms of dramatisation. Our mission was to engage with a contemporary audience, bringing the battles into 21st-Century living rooms using immersive multiple hand-held cameras with often shaky pictures and a dynamic field of vision. We were with them in the trenches, running beside them in open warfare, inside the smoky, smelly, dangerous tanks known as ‘tin coffins’, airborne in flimsy, thrilling, vulnerable bi-planes and beside thundering artillery pieces. 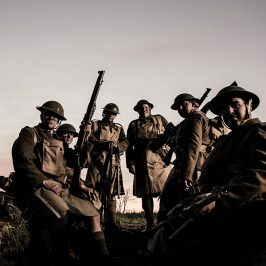 We shot the battle drama in a way that has allowed the audience to be with them to experience the fear, anger, frustration and pain of war, and to capture the aftershock of conflict where soldiers are numbed by relief, remorse and grief. 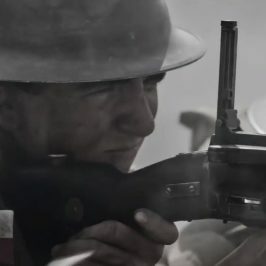 A German soldier aims his gun at a Scottish soldier in the trenches during Operation Michael. 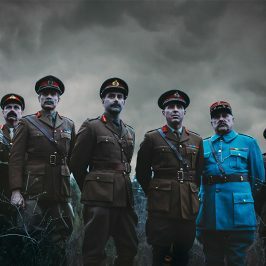 The battles of 1918 embody what came to be known 25 years later as ‘total war’ – fought out of the trenches, in towns, across bridges and canals, scaling hillsides, using covert penetration at night, ‘bite and hold’ tactics, and – for the first time – carefully co-ordinated massed artillery, tanks, aircraft and infantry. Based on carefully researched diary accounts and rare personal testimonies, we drew on these powerful accounts incorporated as ‘voice over’ or transformed into vivid dialogue exchanges bringing the searing experience of our front-line fighters powerfully to life. We contrasted the soldiers’ and nurses’ intense battlefield experiences with the generals’ constrained ‘behind the lines’ world. 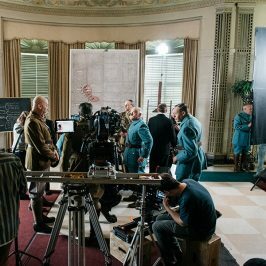 Shooting in some of Canada’s finest historical buildings, we captured an authentic feeling of the French chateaux commandeered by all the armies. We seized the creative opportunities to explore the difference between ‘observing’ and ‘experiencing’. Our generals rarely visit the trenches. Instead, they exist in a world of planning and negotiation, making decisions that will impact on the lives of hundreds of thousands of combatants. 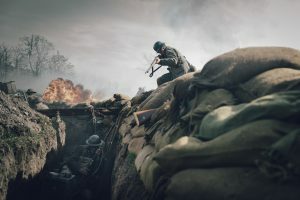 We captured their behind-the-lines world with a style that is tight and controlled, creating a sense of unbearable tension in their HQs, as they plan the battles or listen to distant gunfire while their men carry out their orders. We concentrate on Haig, Foch, Currie and Monash, sensing the isolation they feel at key moments. 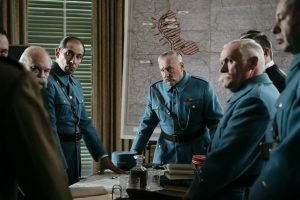 Flanked by his officers and French PM Clemenceau, French Marshal Ferdinand Foch played by Denis Lamonde listen intently. We wanted to keep the entire film set in 1918 so the historians were shot in historic period locations rather than modern offices. There is almost a sense of them being in the next room alongside the generals’ headquarters as they comment insightfully on the unfolding drama of the last 100 days. In the HQ’s where the frame is dominated by our Generals’ faces, sound carries the sense of what is around them, adding to the viewers’ sense of ‘experiencing’ rather than ‘observing’ what is on screen. 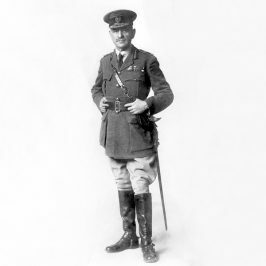 In the battlefield and casualty clearing stations, gone are the well-known WW1 ballads and re-versioned classical strains. Accompanying our modern film language, we’ve incorporated a modern score in a 1918/2018 mash-up. 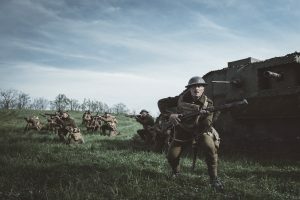 We built a Mk 5 tank especially for the series and shot sequences on actual WW1 aircraft. We employed remarkably convincing state-of-the-art computer generated imagery ranging from animated 3D maps, to novel perspectives such as following shells to their targets, and photo realistic battle scenes with tanks, artillery, aircraft and masses of infantry. Alongside an Allied tank, Canadian soldiers take on the Germans. We drew on the great archive of the 1918 campaigns to keep us in the moment. 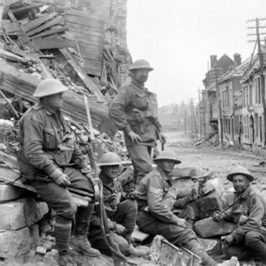 Our multinational treatment allowed us to incorporate British, French, Canadian, American, German and Australian archive sources, creating a fresh all-encompassing perspective of the remarkable battles fought in the 100 Days. 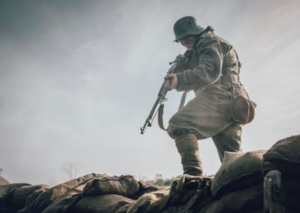 A German soldier ruthlessly takes aim down into the trenches.